Mind that time I was blogging every day in September? Yeah... To be fair this will be my 19th post in the 24 days of September that we've had, which is more blogging than I've ever done in a month - so I think we can claim this month as a victory. Although my Scot Food Fort content is now done, the Scottish theme continues on with this beautiful gift set that I was given by The Scottish Fine Soaps Co. It really couldn't be more welcome as, although I've ended up taking a few days off without posting, posting as much as I have done this month alongside working full time and filming and editing for my YouTube channel I feel absolutely exhausted, and very much ready to book in for a spa weekend somewhere. As it so happens, with my New York trip in December and my Paris trip for February needing to be paid off before I go to NY, a spa weekend is not financially on the cards for me until after Christmas - so I needed to improvise. I say improvise, because using these products did not feel at all like a compromise. 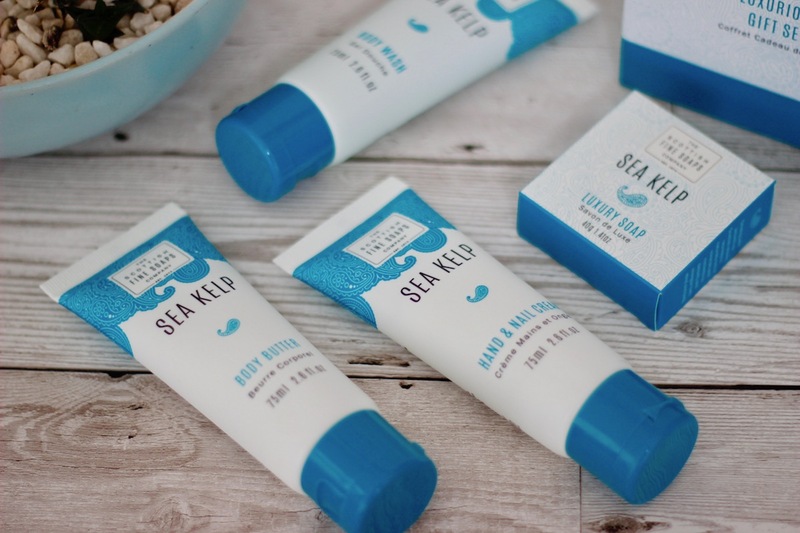 The Sea Kelp scent is beautiful and luxurious, and incredibly spa like. I have been loving the Ren Atlantic Kelp and Magnesium range but given the cheapest product I've used from that range is the £20.00 body wash and the entire contents of this set come in at £12.50 - including being presented in the beautiful box - the Sea Kelp range from The Scottish Fine Soaps Co. is a much more affordable way to get that kelp experience. 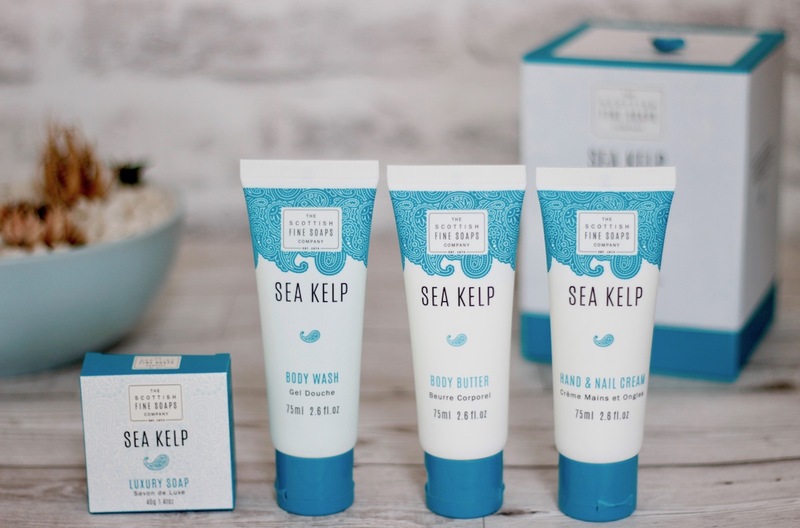 But let's talk about the contents of the set; for your £12.50 you get a solid bar of Soap (40g), a Body Wash (75ml), Body Butter (75ml) and a Hand and Nail Cream (75ml) all with the same Sea Kelp fragrance, obviously. The body wash is absolutely beautiful - you do get a little bit of a lather off of it for those of you who really cannot be without a lather, but it's not a huge foamer which, for me, means it's not drying my skin out. The soap lathers as much as you make it, but as you'd expect from a company built on their soaps, again it's not drying. Although I'm saying these things don't strip the skin, don't interpret that as they're heavy and super nourishing - these are lightweight, refreshing products to use, you feel uplifted after using them, not ready for bed. The leave on products are again lightweight, but they are nourishing. The body butter when sold on it's own can come in the tube (the full size is 200ml) or a gorgeous glass jar, but I think the tube presentation is making sure I don't slather on too much, the way I might do with the jar, and my skin is absorbing it pretty much straight away. For me the phrase 'body butter' usually automatically equates to 'standing naked in the bathroom for 15 minutes trying to wait for it to sink in' (which, when it's winter in Scotland, no one is up for, let's be honest!) but this one is a non traditional body body that absorbs quickly, feels lightweight yet nourishing and that I feel like I can use in the morning or before I need to be somewhere without it being a risk, time factor wise. The hand and nail cream is pretty fast absorbing as well, and I think I'm going to take it in and keep it on my desk in work as the scent is so nice and uplifting that it'll probably help with that 3pm slump we all hit in the afternoon (I say we all because I'm hoping it's not just me who can only stare at a computer for so long before her eyes start to glaze over!) but it's not going to leave me with greasy hands for when I do go back to my mouse or keyboard. 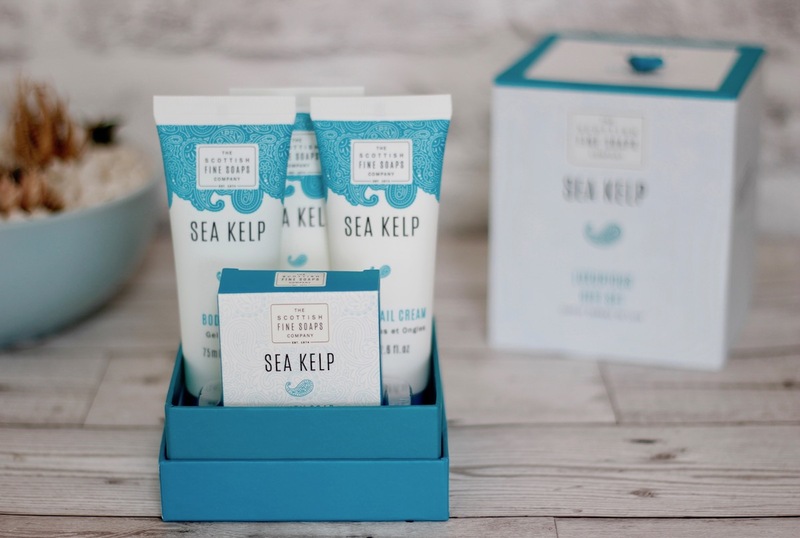 We're in the run up to Christmas and I think this gift set is an ideal present for pretty much anyone who likes to relax and enjoys a touch of luxury - I think I'll be treating myself to the Sea Kelp Bath Essence next, and because it is a very clean, fresh scent I think it's quite a unisex set. Being fairly attracted to manly sets, I'm also pretty interested in the Thistle and Black Pepper range (there's a muscle soak that I really want) and the Manhattan Soap In A Tin - just in case anyone's reading this that's starting to think about what they'd like to get me!